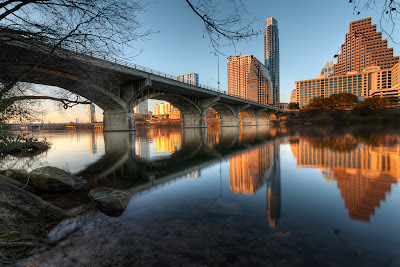 I had the opportunity to take some shots in downtown Austin recently on a day when the winds were calm. It was late in the day, just a little before sunset. 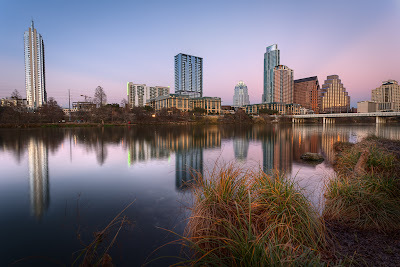 The conditions were great for capturing some of the city reflected off of Lady Bird Lake, so I headed down to the south bank to grab a few shots. I thought I'd share some of the things I've learned about getting a good image of water reflections. 1) You obviously need a lot of light to create the reflections. Choose a time when the sun is low in the sky to get a good angle of light. You'll want the sunlight coming from behind you and your camera. 2) Pick a day when the winds are calm. You want the water to be as still as possible. If boats pass through the body of water, wait until they move on and the wake calms down. 3) Find a subject, whether foliage or buildings, close to the edge of the water opposite of your location. The closer and taller they are, the longer the reflections across the water. 4) Use a tripod. You'll be getting some long exposures, regardless of whether you capture bracketed exposures for HDR processing. 5) Get low. Set your tripod as low as you can. Depending on the location, you might be better off setting the camera on the ground, a rock, or a low wall. Crouch down low, sit down, or even lay on the ground to find the best height for capturing the reflections. People passing by will give you strange looks. That's OK.
6) Use a remote shutter control or the camera's timer to minimize movement for long exposures. 7) Set your aperture to a high number for deep depth of field and to get longer shutter speeds. Set your ISO low to keep noise at a minimum. In my bracketed exposure sets for HDR, I like to get some exposures up in the 8-10 second range. This helps pick up a lot of shadow detail and the longer exposures help smooth the water out. If you are not shooting for HDR, a neutral density (ND) filter may be useful. 8) Capture bracketed images and use HDR post processing. You will be capturing a wide dynamic range and this is an excellent application for HDR technique. You'll be able to bring out a much wider range of light and tones in the water than you can get in a single exposure. Even if you don't want to process an HDR image, you may want combine multiple exposures manually with layers. 9) Include something interesting in the foreground. It might be some plants, rocks, a log...you get the idea. This gives the image depth and makes it much more interesting. 10) Shoot from a shallow edge of water if you can. I love shots where I can see through the water in the foreground. Pebbles and other details seen through the water can be quite engaging. I hope some of these tips are useful. There is great beauty to be found in water reflections. Seek out your own and feel free to share your tips and links to your shots in a comment.